Heat oven to 375°F. In large bowl, beat 3/4 cup sugar, 3/4 cup butter, the vanilla and egg with electric mixer on medium speed, or mix with spoon. Stir in flour, cocoa, baking soda and salt. Shape dough by slightly rounded teaspoonfuls into 3/4-inch balls. Place about 2 inches apart on ungreased cookie sheet. Flatten to 1/4-inch thickness with greased bottom of glass dipped in 2 tablespoons sugar. Bake 8 to 10 minutes or until cookies are set. 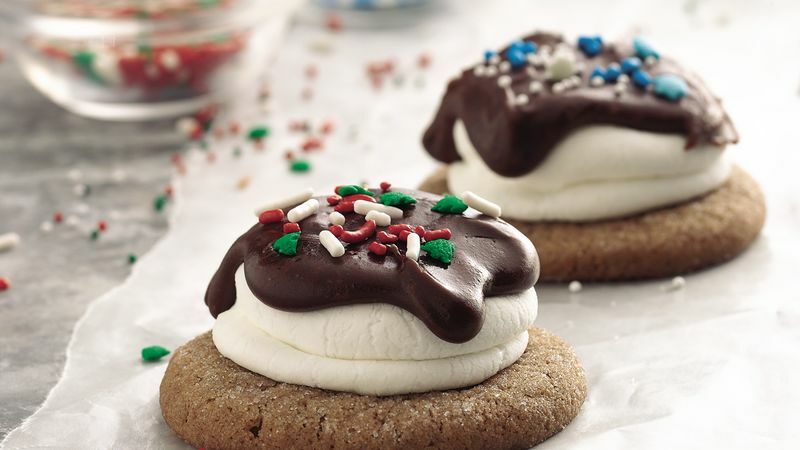 Immediately top each cookie with 1 marshmallow. Return to oven; bake 2 minutes longer or until marshmallows are softened. Lightly press each marshmallow to flatten slightly. Remove from cookie sheet to wire rack; cool 15 minutes. Meanwhile, in 1-quart saucepan, heat 1 cup sugar sugar, 1/4 cup butter and the milk over medium-high heat, stirring occasionally, until mixture boils. Boil 1 minute. Remove from heat; cool 5 minutes. Stir in chocolate chips until melted. Slowly stir in enough water until frosting is smooth and spreadable. Frosting sets up quickly, so thin as necessary with additional water. Swirl about 1 tablespoon Fudge Frosting on top of each cookie. Top with candy sprinkles. Let stand until frosting is set. Use Betty Crocker® chocolate frosting for the Fudge Frosting.